Highways England‘s much publicized roadworks project, “upgrading to smart motorways”, in which the present hard shoulder is being converted into a separate traffic lane to be used during periods of congestion ( much of the time ). Emergency refuges are being created between the two junctions in case of emergencies.. but Highways England neglect to explain how they plan to deal with a vehicle breaking down between the refuges and being unable to move ( a likely common scenario ). Is that really so smart? More serious at the present time ( July – ? 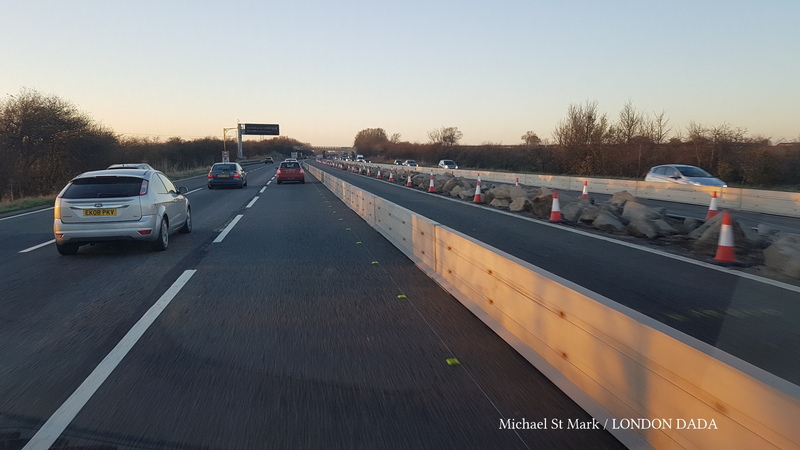 2018 ) is Highways England‘s incredulous use of tarmac-colored steel crash barriers ( again, see above ) to protect workers engaged in various works on the hard shoulder in preparation for the smart lane. You have to say, the choice of color to exactly match the road is not smart – it’s out and out genius. In this key safety area Highways England have well and truly excelled themselves. As the above digital collage shows, even in clear dry conditions the barriers appear uncannily akin to an inside lane of the same road. Why has no-one noticed, or complained about the obvious danger to life of these same-color barriers – that are being extensively used – leading to pile-ups, when less aware or tired motorists may well mistake them for another lane and veer into them, especially in bad light or wet conditions where HGV wheel spray often seriously impairs vision ahead. Perhaps “ghost lane” accidents have already occurred? 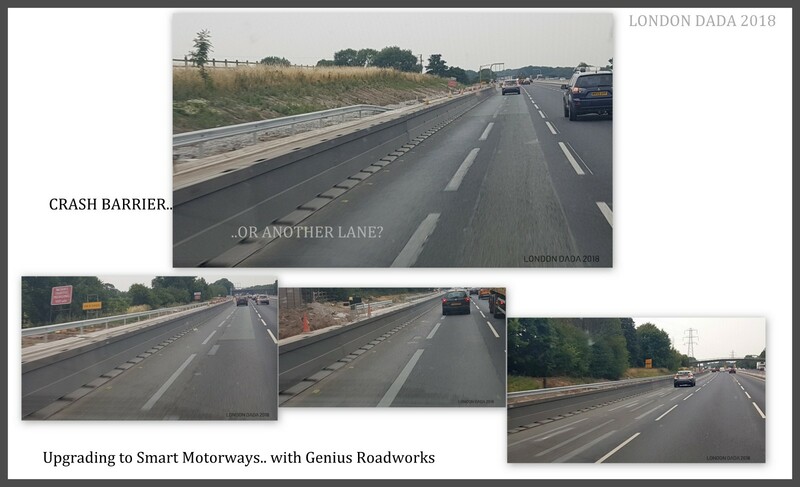 Highways England management; you are invited to immediately instigate the repainting or the addition of standout graphics to all tarmac-gray crash barriers being used in your various current and planned smart motorway upgrades, before their name becomes commonly all too tragically literal. It’s a tough job pointing out bleeding obvious death trap hazards to the English HIghways Agency, who don’t even acknowledge you when they put it right. Recent compliance victory involving Highways England’s complacence in the face of urgent road safety improvements.